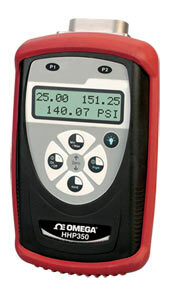 The OMEGA™ HHP350 Series smart manometer brings high precision and value to handheld manometer users. Standard accuracy is ±0.05% FS, including temperature effects, with ±0.025% FS optional. Models are available for gauge, absolute or differential pressure with available ranges from 58 mbar (28 inH2O) to 138 bar (2000 psi). Poznámka: Comes complete with 4 "AA" batteries, protective rubber boot and operator's manual.